Giant fireplaces flanked by leather chairs, 35-foot counters, mosquito misters and outdoor air-cooling systems that rival the chilliest movie theater: Mike Logan 's clients have included "everything under the sun" in their upscale outdoor kitchen designs. But the builder says there are still plenty of possibilities for people with more modest budgets like your Lexington Home. "You can get as basic as you want as long as you follow a few rules as you try to save money," says Mike, owner of Texas Pit Crafters in Tomball, Texas. "First, never build an outdoor island from combustible materials, including plywood countertops covered with tile. Second, when you're laying out your design, factor in some usable counter space no matter how small your outdoor space will be. You can't have grills and sinks butting up against each other with nowhere for you to work." Third, says Mike, if your outdoor kitchen will be any significant distance from the indoor kitchen, allow at least a small budget for adequate storage space for frequently used items like grill brushes, forks, spices and paper towels. "You don't want to spend the whole time running back and forth," he says. After you attend to those basics, there are plenty of areas to tackle for savings. "Running gas lines, electricity and water to an outdoor island is fairly expensive," says Mike. "If you're on a tight budget, you might want to consider using propane bottles to fuel your grill." It's counterintuitive, but you have a better chance of sticking to a budget if you sink money into a high-quality grill. "I can't tell you how many times customers end up calling us back a year later to replace a low-quality grill," says Burt Stavinoha of Kooda Exteriors, an outdoor kitchen retailer and contractor in Garland, Texas. "They're going to burn out on you." Mike strongly recommends a grill made from high-grade stainless steel. "Look for a model made from at least 304-grade stainless steel, interior and exterior, because if the inside rusts out there's nothing you can do to save the rest," he says. His favorite options include grills manufactured by his own company, Texas Pit Crafters, and also Fire Magic, Tec and some Viking models. Even the quintessential luxury centerpiece for an outdoor kitchen, the brick oven, can cost less if you choose carefully. "The easiest and fastest way to build a wood-fired oven is to build a small foundation, three masonry walls and a support shelf and then install a good quality pre-fabricated oven kit," says Sergio de Paula, president of Fogazzo Wood Fired Ovens and Barbecues. "Then surround the oven with masonry, and add a chimney system and a simple roof." According to Sergio, even the average do-it-yourselfer can finish an oven in about a week and professional masons or contractors can do it in just a few days using a prefabricated oven kit. However, having an oven built brick by brick can easily cost several times more. "That can take a do-it yourselfer up to one year and a professional mason several weeks," Sergio says. "Another factor to consider is that, brick by brick, ovens are typically larger than pre-cast oven kits and therefore need more wood to reach cooking temperatures, which makes them cost more to operate than the prefabricated models." "One affordable option for bar-height seating is directors' chairs with slings that come off so you can throw them in the wash," says Linda Moran, owner of the Hill Company in Philadelphia, which carries residential and commercial outdoor furniture. "Since they're not super-durable in bad weather, you will want to bring them in for the winter or if you're going to have storms for several days; but that's not a problem since they fold up and you can just slip them under a counter or in a closet." One manufacturer she really likes is Telescope. "They've been in business 105 years and their directors' chairs are a sharp-looking option for counter stools." As for a table and chairs, Linda recommends affordable wrought iron, but only if it's high quality like the models made by Meadowcraft. "Six chairs and a table should only run you about $800, but look for wrought iron with a good undercoat and a good powder coating, just like a car," she says. "That's not going to rust on you later." Another option is aluminum dining sets. Just make sure to examine the pieces for superior welding and buy the heavyweight stuff. If you're looking at seat cushions, the ones that last the longest and look the best are made from 100 percent acrylic, solution-dyed fabric. "They're the best buy for the money because they're mildew- and water-resistant and will last three or four times longer than canvas or other washable cushions," says Linda. "If they do get dirty, you can scrub them with a little bleach and hose them down and they'll look as good as new." To save money in the long term, remember that outdoor furniture needs care and replacement parts. "Look for a 15-year warranty on metal furniture and buy from a good outdoor furniture store, not a 'big box' place," says Linda. "That way you can get the pieces repaired or replace the slings or strapping instead of having to buy all-new furniture every time something breaks." Whether an awning, arbor, gazebo or standard roof, cover for an outdoor kitchen can be one of your greatest expenses. If you can get by covering only your counter space or dining area, consider doing that with an umbrella, at least until your budget allows for something more elaborate, says Linda. "There are cantilevered umbrellas available from companies like Treasure Garden in many patterns and price ranges that attach to the side of a counter or table surface, not a hole in the middle," she says. "Consider an umbrella with a cover that comes off so you can throw it in the wash and put it back on damp, which will take care of bird droppings and other dirt." 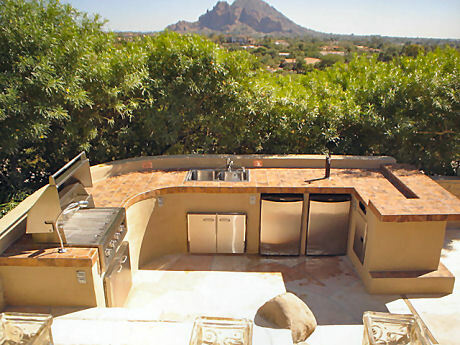 Building codes and plumbing costs can make a sink one of the most expensive outdoor kitchen propositions. Mike Logan of Texas Pit Crafters does install them, but he says more and more of his clients are opting for under-counter water heaters. "They run about $300 and take away the need to plumb hot water from the house," he says. "Customers on a strict budget typically concentrate on getting the deck or arbor built first," says Kooda Exterior's Burt Stavinoha. "But even if you can't afford anything else right away, have the forethought to beef up the flooring slab where you might later put an island, or pour the foundation for a future fireplace when you pour the concrete for the deck. Also run the electricity and the gas for anything you might want down the road at the beginning. It's a big expense to rip up floors or walls to install that later." Grills on rolling carts are another nice way to plan for an upgrade later, says Mike of Texas Pit Crafters. "Most grills and smokers can be installed with a grill on a rolling cart with an adequate number of side trays and some storage beneath and then removed later and reinstalled into a pit if your budget increases," he says. "The cart's a great idea if you want the feel of an outdoor kitchen on a tight budget." Most of the company understand that,selling a bad quality product is a huge waste in time. In these reason why there are many companies doing research first before they release their products. but a modern high quality product such as this "www.gvshopfit.com, you have made a right choice by investing your money on this one.They are 100% financing. A best equipment concept in your backyard serves as best price equipment to build your new store or business.